You probably scratched your head last year if you read about time crystals, likely 2017’s most esoteric, widely covered popular science story. Even if you understood how they worked, you might not have known what use they could have. 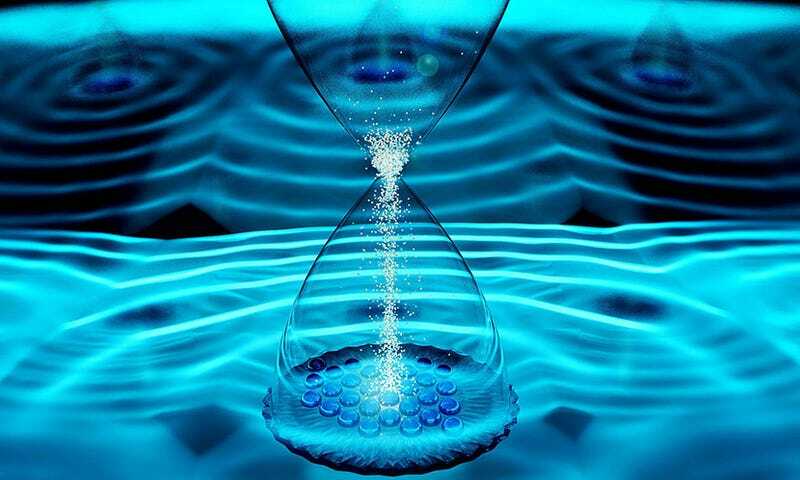 Time crystals, systems of atoms that maintain a periodic ticking behavior in the presence of an added electromagnetic pulse, have now piqued the interest of one well-funded government agency: the Department of Defense. The DoD’s Defense Advanced Research Projects Agency, or DARPA, announced a new program to fund research on these systems. More generally, the new DRINQS program will study exactly what its acronym stands for: “Driven and Nonequilibrium Quantum Systems.” But why? “The applications could be for atomic clocks, where you have an ensemble of atoms you’re vibrating to extract time information,” Ale Lukaszew, program manager in DARPA’s defense sciences offices, told Gizmodo. “There might be applications related to measuring things with exquisite sensitivity in time and magnetic field domains. Not a lot of these applications are open for discussion.” In other words, time crystal-based military technology is classified. Despite their name, time crystals are relatively easy to understand. Their atoms have an innate property called spin, which turns each one into the smallest possible bar magnets. Time crystals are systems of atoms with a regularly pulsing force, like an electric field, acting on them. This force causes the spins to swap directions regularly. Except the spin’s ticking need not align with the field’s pulsing. It’s as if the system has taken on a mind of its own. Imagine turning a jump rope, but the rope (the atom’s spin) cycles one time for every two times your arm turns (the electric field), as physicist Norman Yao at the University of California, Berkeley once told me. DRINQS will fund research for more than just time crystals. Its mission is to study the weirdness of quantum mechanics and potentially find places where driving a system, like adding a regular electromagnetic pulsing force, makes the atoms take on more stable behaviors than they’d have without the pulse. Even if the added pulse wavers a little, the atom keeps its regular ticking. This means that the atoms may be able to retain quantum mechanical properties for a longer period of time without being knocked around or influenced by a neighboring atom. Super-precise clocks immediately come to mind as an application for this strange science. While somewhat boring, precise clocks can be very useful. For example, time moves slower in places with higher gravity. The effect is tiny here on Earth, but measuring different gravitational effects with a precisely ticking driven system could allow for things like positioning without a GPS satellite. But there are even further possibilities. High coherence times could be important for future quantum computing applications. Ronald Walsworth, Harvard physicist, told Gizmodo that his team works on one such non-equilibrium system, called nitrogen-vacancy centers. These are diamonds with single carbon atoms swapped for a nitrogen atom that could be useful in MRI imaging and other uses related to magnetic fields, like identifying the origins of rocks. The agency has not selected researchers yet, and the amount of funding isn’t listed in the agency announcement, but proposals are due April 9. Lukaszew thought the first results might be published late this year.